This triple pedestal dining room table features a rare third center pedestal for maximum table support. Three solid hardwood pedestals enable this table to support multiple extensions to make it the perfect large-party serving table. This solid hardwood table can hold up to 14 leaves and extend to 20 feet long with all leaves in. The ideal Thanksgiving table, the beautiful, hardwood Scranton Triple Pedestal Dining Table can seat over 14 guests with ease! You can order up to 14 leaves with this Amish handcrafted pedestal table. This is the perfect extra large dining table for someone with a big family. Each Pedestal is handcrafted with details by highly skilled Amish craftsmen. They feature plain feet with gentle, Queen Anne inspired curves. More detailed claw feet are also available. The Tabletop is a solid 1" thick and completely hardwood. You can choose from six beautiful hardwood options, and countless more stain and finish options. 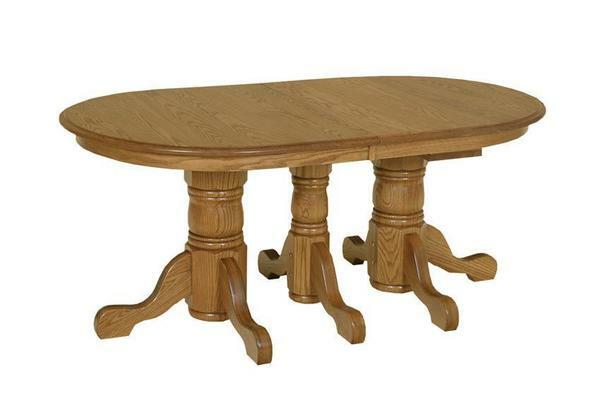 The Scranton Triple Pedestal Table is made in America and fully customizable. Call to speak to one of our friendly and knowledgeable Amish furniture specialists today at 1-866-272-6773 or visit them in our Sarasota, Florida Brick and Mortar Store. Thank you and the same to you and your family. It's been a pleasure dealing with you and DutchCrafters. You have a long term customer and we've already recommended you to friends & family! Thank you for your service.